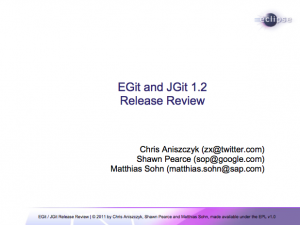 The EGit and JGit teams are happy to announce the 1.2 release, just in time for the holidays! It can be downloaded from the Eclipse Marketplace or the p2 repository. There’s a lot of new improvements, including better performance and stability. If you’re interested in the details of what’s new, check out the JGit New and Noteworthy and the EGit New and Noteworthy. We hope you find the release useful and please enjoy the holidays!